Have you heard the news? Assessment teams all over Virginia are integrating the Decision Tree into practice (Drum Roll Please). 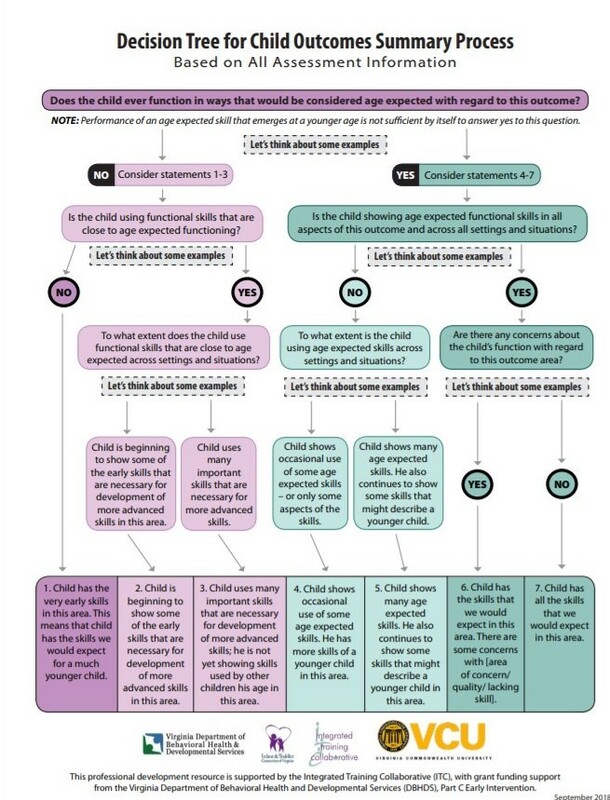 The Decision Tree is a tool used for teaming and family engagement during the child outcomes summary process. Let’s imagine that a team from Collaboration County is successfully using the Decision Tree. What might this look like? Keep reading to find out. Let me introduce you to the team as we check in with them prior to, during, and after their assessment for service planning (ASP). Before reading about this team’s example below, print the Key Tips handout. Highlight the tips you see as the team implements the Decision Tree. At the staff meeting, Margaret (LSM) introduced the new Decision Tree to the team and handed them a copy. She helped the team familiarize themselves with the Decision Tree by facilitating a discussion using a scenario-based Learning Byte. Margaret divided the team into pairs. Khadijah (SC) practiced facilitating the discussion on Social/Emotional Skills, including social relationships with Anika (ST). Khadijah explained what is expected in this area for a 28 month old child. She discussed some specific examples when prompted on the Decision Tree. Khadijah asked Anika for additional input. Khadijah did not feel comfortable at first, but began to feel more familiar with the flow of the Decision Tree. Anika (ST) took a turn and practiced as well. Anika and Khadijah quickly realized the importance of gathering information about a child’s development and participation across all settings and situations in order to be successful implementing the Decision Tree. Margaret (LSM) reflected with her staff on the activity and provided time to ask questions and support each other through this process. Everyone loves how the Decision Tree engages the caregiver as an integral member of the team. After the meeting, Khadijah (SC), Anika (ST), and Charles (Ed) discussed who would facilitate the child outcomes summary discussion at their next assessment with Tyler and his family. Khadijah (SC) agreed with her team to facilitate the discussion. During the assessment for service planning, Charles (Ed) helped to ensure team members asked a variety of open-ended questions that included how the child participated throughout several settings and routines. When it was time to discuss the three outcome areas, Khadijah (SC) showed Marisol, Tyler’s mom, the handout on the Infant & Toddler Connection of Virginia Child Outcomes Summary Process as she explained what the three child outcomes entail. Anika (ST) noticed Marisol’s eyebrows furrowed. She asked Tyler’s mom, “What questions do you have for us?” After answering questions, Khadijah continued to facilitate the discussion in each child outcome area. Anika (ST) and Charles (Ed) each provided specific examples of the child’s strengths and areas of growth. Marisol added individualized examples of Tyler’s functional skills within different routines like waking up and going to the grocery store. During the discussion, Tyler began to cry and Marisol stated he was probably hungry. Khadijah (SC) asked Marisol if she would like to move the meeting to the kitchen while Tyler ate a snack. Marisol agreed this would be best before continuing to help her focus on the discussion. Khadijah (SC) showed the team the Decision Tree to thoughtfully reflect on each question. Marisol contributed specific examples of Tyler’s abilities and activities along with Anika (ST) and Charles (Ed) until they agreed on a statement to describe Tyler’s functional behaviors compared to his same aged peers. Khadijah, Anika, and Charles left the home and met back up at a coffee shop. They reflected on what went well. They agreed each of them provide a different perspective and supported to the family throughout. Changing rooms to finish the discussion helped satisfy Tyler when he was hungry and engage Marisol in the discussion. Team members provided support to each other throughout the process. Khadijah, Anika, and Charles identified ways they could grow as a team. Khadijah (SC) reflects that her explanation to Marisol on the child outcomes summary process could have been more detailed to help Marisol understand and feel comfortable participating. Charles (Ed) wants to write down examples within routines and settings so he does not forget as they discuss each area. Anika (ST) showed Charles the tool she utilizes called the Assessment for Service Planning Notes Template. Anika (ST) wants to practice asking more open-ended questions around routines. At the next staff meeting, Margaret (LSM) reflected with her staff on how implementation of the Decision Tree was going. It was a rich discussion filled with what has been going well and how her staff would like to improve. You heard it here first folks. The Collaboration County team is engaging families and utilizing strong teaming and collaboration throughout the child outcomes summary process. How do you implement the Decision Tree in your locality? What ways do you enhance your teaming process? What strategies do you use to engage the family in the child outcomes summary process?